-Swimming pool and spas water temperature will vary from about 18° C (swimming pools) to about 43° C (hot tubs and spas). The pH of water in these equipments will optimally range between about 7.2 and 7.6 for bather comfort, safety and efficiency of disinfection by chlorine (Cl + ) sanitizers. to be disinfected. Bromine and certain compounds containing bromine are used similarly but to a much lesser extent. Free chlorine can also be directly injected in water by hydrolysis chlorinators using salt (Nacl). Most of time, this water has unknown levels of chlorine, chloride, bromine, ozone, and other unknown additives. Free chlorine is the most corrosive ingredient that can be found in water used in these applications, and initiates pitting and crevice corrosion..
To evaluate the corrosion resistance of stainless steel of heating elements tubes, Ultimheat has set up a comparative corrosion testing process. This test is made with constant chlorine level, using piping with no or low chemical reaction with free chlorine. It is not possible to test in exact final application, as the residual free chloride level in the circuit depends of the volume, piping material, and water composition, and decrease with time. Accelerated testing is made at higher temperature and concentration to reduce testing time. For more about chloride consumption by piping material, refer to: Combined chlorine dissipation, pipe material, water quality and hydraulic effects, by Ginasyio Mutoti and others, published in American water Work association journal, October 2007. -There are no comparatives studies made on 304L, 316L, incolloy800, 825, 840 and titanium tubes for chloride pitting or crevice corrosion resistance. Some of them, supplied by raw material manufacturers are commercially oriented, and conclusion depends of the type of tests made. 7/ Proximity contamination initiated by iron oxide or other contaminants coming from other components of the equipment, and deposited in the welding and fittings interstices. This contamination is aggravated by the galvanic potential of two differential metals. – The accelerated corrosion testing is made to check the corrosion resistance to chloride and chlorine, including interface with air and liquid, on plain raw material, edges, welding, with and without passivation, with and without mechanical pickling by sand blasting. Passivation is made using our standard citric acid passivation process. – Test specimens were made of 200 mm long tubes, BA surface finish. – Test specimens have a longitudinal TIG welding. This welding process was not made in Ultimheat, but by tube suppliers. – Test specimens have been carefully high temperature degreased and rinsed and handled with gloves until they were immersed. -Test specimens surface has been prepared as follow: 4 specimens of each tube, 2 of them were sand blasted, 2 of them not sand blasted, and 1 of each two has been fully passivated, the second one was not passivated. Titanium tube was not passivated. – Sand blasting has been made with aluminum oxide, (aluminum oxide grit powder, mesh 120, without iron or iron oxide content). This sieve size is usually what is recommended to avoid corrosion. -For the first test, specimens have been immersed in the testing solution (5% active chlorine = 50.000 ppm) . The testing solution is made by dilution of a 10% solution with distillated water), during 96 hours at 70°C. -For the second test, only one specimen of each tube has been made, passivated and immersed in a low chlorine testing solution (0.02% of active chloride = 200 ppm). The testing solution is made by dilution of a 10% solution with distillated water), They were immersed during 1000 hours at 70°C. -About 20 mm on the top side of specimens were not immersed to check the liquid/ air interface corrosion resistance. -Pictures have been made with the same high resolution camera, at same distance, with same light. The same amplification ratio has been used on all pictures used in this document. -The testing equipment is made in PVC to avoid equipment corrosion by high concentration chloride and contamination, and the chemical decay of chlorine corresponding to its reaction with ferrous ions released by iron dissolution. 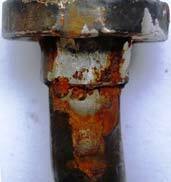 2-When not sand blasted, passivation made by Ultimheat does not improve much corrosion. This is due to the fact that tubes suppliers use to supply standard passivated tubes. 1-Sand blasting must be proscribed, even to clean brazing, soldering or welding. 2-Without Ultimheat passivation, corrosion is initiated on all types of stainless steel. To validate the short term results, a 1000 hours corrosion test was made on full passivated tubes with a 200 ppm free chlorine concentration (same equipment, same temperature that the first test). Free chlorine content was checked and adjusted every 48 hours. Based on the short term preliminary results, Only passivated and not sand blasted tubes were tested. Conclusion: Most of raw materials do not show corrosion on immersed parts. The 321 sample was certainly welded with wrong protection gas, or no protection gas. The 904 sample was corroded on non welded places and also on air liquid interface. It is the worth choice. On air/liquid interface, best results, equivalent to titanium are 316L and Incolloy 825. Based on this test, most suitable materials are Titanium, 316L and incolloy 825, with equivalent results Incolloy 800, 840 and 304L are also a good choice for water with less chlorine content. Conclusion: Corrosion starting on the stainless steel start corrosion on the titanium tube. – On all stainless steel tested, the most important parameter is not the raw material composition. It is the process used to weld it, clean it, and the final passivation process that gives the corrosion resistance. 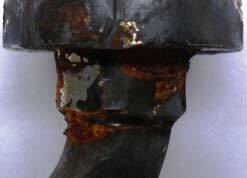 – On immersed parts, corrosion occurs mainly on tube weld line, and when it has started it follows the weld line. 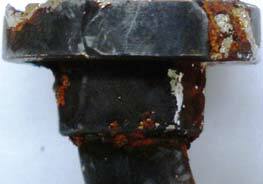 – Pitting corrosion occurs at the air/liquid interface, where the most oxidizing conditions exist. 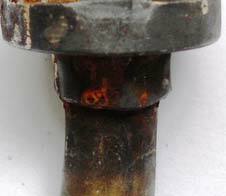 – Corrosion occurs by cross contamination by corroded fittings. This is the only thing that initiates corrosion on titanium tubes. – Ultimheat citric acid passivation really improves the corrosion resistance even in the worth conditions. There is no major difficulty to weld stainless steel shown here. The corrosion resistance of the welding is achieved by using correct welding parameters, and appropriate shield gas outside and inside the tube. The main problem is that cannot easily be checked, as most of time tubes are polished. Careful visual inspection inside and outside can give a first opinion, but the most efficient way is to check the welding quality is the corrosion testing described in this document. It will show immediately the welding defects and raw material homogeneity in the welding line. Titanium welding is difficult and use of wrong shield gas during welding makes it brittle and also brings corrosion risks. bending or welding, these micro-cracks do not disappear if the bending radius was too small. Ability for the raw material to withstand this bending is given by the material elongation value. The best elongation value is achieved on 304L, 316L, 321, followed by the other stainless steels. Titanium is the worth with an elongation value less than 50% of the 304L stainless steel. This means than is some particular application the titanium tube thickness must be increased to achieve short radius. Another problem with Titanium is that when stress relaxation process is made on heating elements, the Titanium tube diameter increases, and the magnesium oxide used for heat transfer inside the tube loses its compacity and heat transfer properties. 304L, 316L, 321 and Incolloy 800 tubes are easily available. Estimated relative cost of 8 to 12 mm diameter welded tubes, related to 304L price. Based on raw material prices on 30/11/2009. EU: The European drinking water guideline 98/83/EC does not contain guidelines for chlorine. USA: The national drinking water standards state that the maximum residual amount of chlorine is 4 mg/L. Other countries: Most of them use the European directive or the WHO standard. In some Asian countries, the level can rise to 100 mg/L and up to1000mg/L in some Indian cities. -Free chlorine: the amount of chlorine present in water as dissolved gas (Cl2), hypochlorous acid (HOCl), and/or hypochlorite ion (OCl-) that is not combined with ammonia or other compounds in water. This is the most oxidant ingredient. -Chlorine residual: the concentration of chlorine species present in water after the oxidant demand has been satisfied. monochloramine (NH2Cl), dichloramine (NHCl2), and trichloramine (nitrogen trichloride, NCl3). 13.3 Chlorine checking process: EN ISO 7393-3:2000 (Water quality. Determination of free chlorine and total chlorine).